If you’ve spent any time in downtown Chattanooga over the past few years, it should not be a surprise to you when we say that the coffee culture here is thriving. We’ve seen locals open up shops with their very own flavor, such as Velo Coffee’s focus on sustainability and Plus Coffee’s mobile coffee digs. The traction has caught the attention of companies in nearby Southern cities, like Birmingham’s Revelator Coffee and Nashville’s Frothy Monkey who have both set up shop downtown. Among the several companies in the area is a small operation located on South Broad Street called Mad Priest Coffee Roasters. 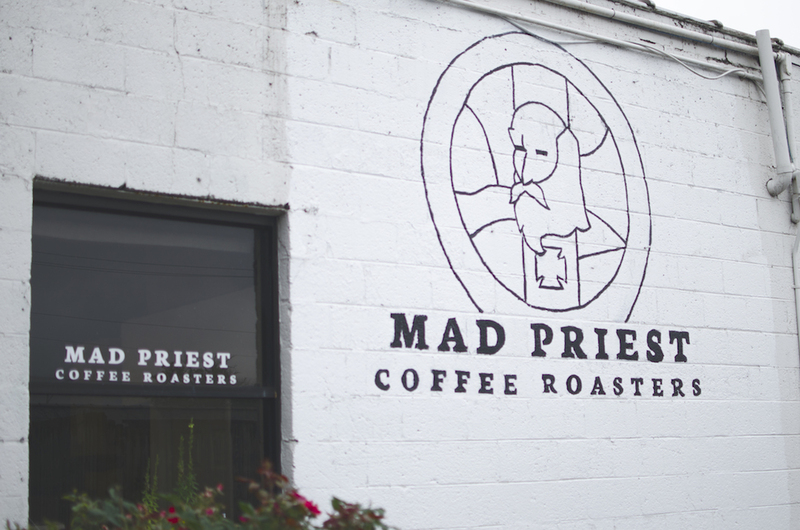 Mad Priest is fairly new to the local scene (opened its doors in December 2016) and is one of a few coffee industry companies we’ve had the privilege to work with through our programming at CO.LAB. If you were on the radar of Mad Priest’s crowdfunding campaign early last year, you may remember a key element of their business model, which is that they employee refugees. We spent a quiet rainy Friday morning at Mad Priest talking shop with founder and owner, Michael Rice, about the origins and journey of his new venture. Later when they came back to the states, Michael and his wife wanted to stay in the industry but also wanted to find a way to address the global refugee crisis in their own way. So they decided to start Mad Priest Coffee with the intent to hire refugees, thus marrying the two ideas. First, he started with a successful Kickstarter campaign that garnered attention across the Chattanooga community, much in thanks to The Camp House’s support. Michael quickly discovered the funds gained through Kickstarter were enough to purchase necessary equipment, but they weren’t enough to sustain a brick and mortar business. Around that time, Michael came to CO.LAB to join a CO.STARTERS cohort in early 2016. CO.STARTERS is a 9-week program designed to turn aspiring entrepreneurs’ ideas into active businesses. Each week the curriculum covers a different aspect of developing a business, with the CO.STARTERS canvaslaying the foundation. In the program, entrepreneurs are pushed to talk to customers and start thinking in simple dollar terms about their businesses. After graduating from the program Michael continued to work with CO.LAB by utilizing Office Hours—free 1-on-1 consultations with local business advisors in areas such as legal, accounting, communications and other core competencies required to get a business off the ground. Michael later became the first entrepreneur we worked with to help obtain a loan through a partnership with Tennessee Valley Federal Credit Union’s new startup loan program, Idea Leap. After just a few weeks, Michael sat down at the conference table in our office to cross the t’s and dot the i’s. With the loan, he was able to open the shop’s doors in late 2016. To further the mission of Mad Priest Coffee, Michael recently launched Mad Priest Events, an event series designed to celebrate the diversity of people and culture in Chattanooga. Recent gatherings include An Evening with Iraq?—?a traditional Iraqi dinner prepared by two Iraqi refugees?—?and World Refugee Day at The Camp House, which Michael partnered with Bridge Refugee Services to host. Through his relationship with Bridge Refugee Services, Michael has been able to hire two refugee employees at the shop and also support a number of other refugees through Mad Priest Events. When Michael moved to Chattanooga, he and his wife didn’t know anyone. Two years later, he launched a fully operational business. Michael held onto his vision for a long time. Finally when it came time to make that vision a reality, he set off in the community to find the resources to make it happen. Do you have an idea tucked away? Are you tinkering with something in the back of your mind, or even have sketches on a napkin? Come and talk to us at CO.LAB by scheduling a Wayfinding Meeting with one of our team members. We would love to learn about your idea and see how we can help you get it started.